Often the most precious gifts of life come in ways we neither plan nor expect. Who would have thought that a botany scientist couple would become messiahs of a unique cancer crusade? An incredible couple on an inspiring mission – Dr.. Shyamsundar Joshi and Dr. Shantha Joshi are on a unique cancer-combatting mission – insuring health through wonder herb ‘Simarouba glauca’. As I enter their grounded home at R. T. Nagar, I am curious to meet the “70-something couple” who are slowly becoming “legends in their own way”- purely by word-to-mouth propaganda. The sight of the unusually long queue of cancer-struck patients alongside their families further assure me that I am indeed at the right place. And finally, after a four-hour hiatus, as I finally meet Dr. Shyamsundar Joshi, I am suddenly overwhelmed by his aura – positivity, humility, and dedication personified. And complimenting him is his down-to-earth and dignified better-half, Dr. Shantha Joshi. Sree Satkriya Foundation’s “Sat Jagruti” is an awareness campaign which covers perspectives on various aspects of cancer. One of our special features ‘Herb of Hope’ seeks to explore and endorse cancer-healing perspectives within the realms of nature. As part of our cancer initiative, we met Dr.Shyamsundar Joshi and Dr.Shanta Joshi. As I catch up with the retired scientist couple over an hour-long candid chat, they open up on their Simarouba journey, its medicinal properties and much more. Here are excerpts from our conversation. So I see, you are quite a legend here. People treat you like a messiah. Where do you get this energy from? Dr. Shyamsundar Joshi: I am no messiah. I’ve never considered myself one. Who am i to treat people? It is nature’s gift that is being passed on to mankind. We are all “Mother Simarouba’s children.” Who am I to take credit for the gift she has been endowed with? I am just nature’s servant, that would be appropriate. They say, “Discovery is seeing what everybody else has seen but thinking what nobody else has thought.” So tell us about your collaborative journey towards this unique “cancer-healing’’ mission. Dr. Shyamsundar Joshi: Originally, herb Simarouba was introduced to India by the National Bureau of Plant Genetic Resources in the early 1960s and it was brought to The University of Agricultural Sciences by Dr. K. Krishnamurthy, the then-Director of Research of our University. From the year 1986, we started research on the herb under the guidance of Dr. B. R. Hegde who still continues to guide us. Initially we began research on non-medicinal lines, to overcome the edible oil crisis. It can produce ethanol, bio-diesel, hence has immense potential for use as a biofuel. Then we discovered its timber value—it can be used as a substitute for white cedar and white pine. It’s extremely eco-friendly—its oil cake is superior to neem oil cake and an excellent manure. Most importantly, it’s a hardy, water-prudent crop which can convert dry lands into fertile lands, once cultivated. It produces lot of oxygen and biomass thereby improving soil fertility. Its leaf litter is best for vermicomposting. Each year, 4 tonnes of organic manure can be prepared easily. It was later on that we began research on its medicinal value. 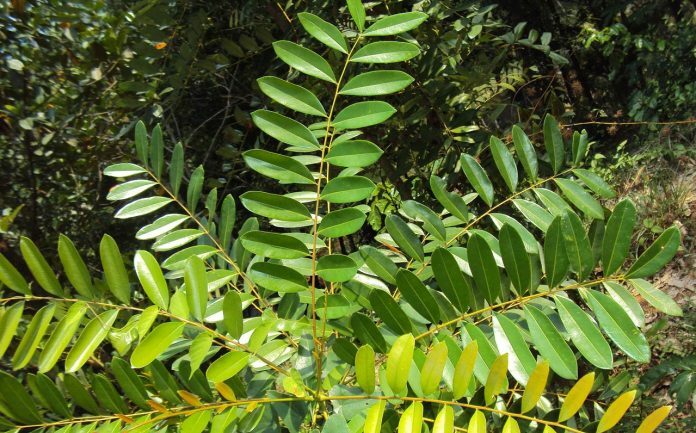 The chemicals present in the leaves, rachis, and barks of Simarouba are anti-viral, anti-bacterial, anti-protozoal, anti-helmentic, anti-cancerous, anti-amoebic and anti-malarial. The same has been published and validated in all major international medical journals. Thereafter we experimented on ourselves. I personally used it to cure my amoebiasis and chikungunya completely, after which we were approached by terminal cancer patients with zero hope, who recovered completely. Since then thousands of patients have been benefitting from the research. The University of Agricultural Sciences, Bangalore, has been supporting and assisting our research program for the past 26 years. How does Mother Simarouba counter cancer? Specifically which types of cancer? Dr. Shyamsundar Joshi: All types of cancers can be cured, depending on the stage—first and second stage can be completely cured, whereas third- and fourth-stage cancer patients can be assured of the quality of life. Typically in case of people who undergo chemotherapy, improvement in appetite would be the first indication of the medicine working on the body. There will also be a steady reduction in body pain. Gradually overall immunity would be strengthened as the herb sets into the body and energy levels are improved. Unlike chemotherapy, which kills both cancerous and noncancerous cells, Mother Simarouba eliminates the cancer cells alone. Therefore the side effects due to chemotherapy do not arise in the latter. Moreover Mother Simarouba works on both preventive as well as curative aspects. Dr. Shanta, is it true that this wonder herb works on gynaecological disorders too? Dr. Shanta Joshi: Yes – irregular and painful menstrual cycle; excessive bleeding; leucorrhea (white discharge); and menopause and its resultant issues such as mood swings, hot flashes, and hormonal imbalances—Mother Simarouba balances progesterone and estrogen levels. Once it is established into the bloodstream, it takes about 3 to 6 months to completely cure the same. What has been the survivor rate, so far – specifically cancer patients who were administered Simarouba powder and its concoction? What is your message to us and many more like us? Dr. Shyamsundar Joshi: Cultivation of Lakshmi Taru offers solutions to many health problems faced by individuals and the society at rural as well as urban levels, not just cancer. I would encourage more and more people to grow Simarouba in their home yards and achieve health security. Gift a simarouba to your near and dear ones – you are gifting them health insurance for life. We all have different inspirations but one goal – a better world, a cancer-free world. Let’s spread the word. Join ‘Sat Jagruti’s cancer crusade. Plant a Simarouba and pass on the legacy of health insurance to your future generation, because nature listens, nature heals. Dr. Shyamsundar Joshi and Dr. Shanta Joshi are based out of Bangalore and can be reached at 09448684021/09986998223.